The scaphoid is one of the small group of bones in the wrist called the carpal bones. It is the most common carpal bone to fracture among athletes and is often caused by falling onto an outstretched hand. Wrist pain and trouble gripping things are symptoms of this type of fracture, and medical advice should be sought for treatment. There are a number of different types of wrist fracture which can occur and it is important an accurate diagnosis is made to avoid long-term complications and deformity. Symptoms of a scaphoid fracture include pain in the wrist at the time of injury and rapid swelling at the back of the wrist. Pain may settle down soon after the fall but the patient will have difficulty gripping things. There will be tenderness when pressing in on the wrist compared with the noninjured wrist. The exact area of tenderness is called the anatomical snuff box and is located between two tendons on the thumb side of the wrist. Compression of the thumb inwards towards the wrist causes pain. Initially, treatment of a scaphoid bone fracture would be to apply ice or cold therapy, protect the wrist with bandaging or strapping and seek medical attention. A doctor will X-ray the wrist to confirm a diagnosis of a scaphoid bone fracture. However, the injury may not always show up on an X-ray. If the doctor suspects a fracture but the X-ray is normal then it cannot be ruled out. In this case, an MRI or bone scan will reveal the fracture. The wrist will be immobilized for 8 weeks in a plaster cast extending from just below the elbow, over the wrist and base of the thumb. A scaphoid fracture cast of this size is needed to properly immobilize the wrist and allow the bone to heal. After 8 weeks the scaphoid fracture is re-assessed and rehabilitation exercises can begin along with a gradual return to sport. It is important to fully strengthen the wrist following so many weeks in a cast as the muscles will waste away. Scaphoid fractures have a risk of not healing properly due to the poor blood supply. If this happens then in some cases the fracture is immobilized again for a further 4 to 6 weeks. Immobilizing beyond this time is unlikely to be beneficial so in this case, surgery is often required and many surgeons would do this sooner rather than opt for a further period of immobilization. The bones in the wrist need to move in a perfect arc and if there is any disruption to this movement then pain and stiffness is the result. A scaphoid fracture typically affects young adults in their 20’s and 30’s and is caused by a fall only an outstretched hand. If can also be common in punching sports such as boxing. 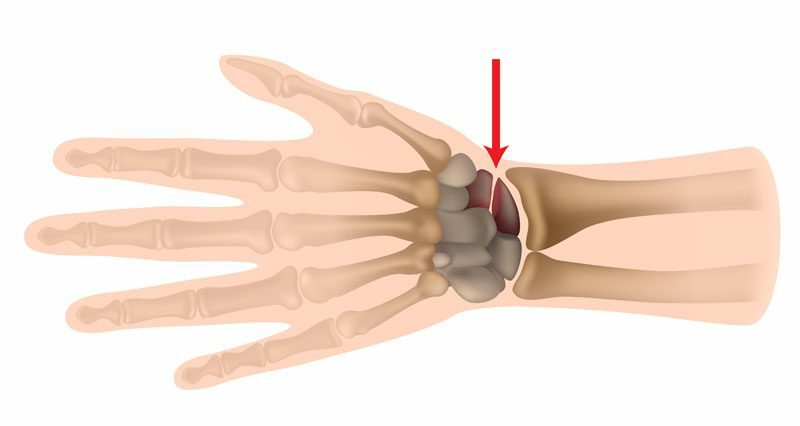 The scaphoid bone is particularly important and if it does not heal properly this can lead to progressive stiffness and pain in the wrist possibly leading to arthritis or wear and tear in the joint known as post-traumatic arthritis of the wrist which is particularly debilitating. If a scaphoid fracture is not identified and treated early enough then it is very difficult to get to heal. This is particularly likely because a scaphoid fracture on an X-ray is often not seen initially and the injury diagnosed as a simple sprained wrist. So if an athlete has a history of a fall onto an outstretched hand with pain in the wrist and particular tenderness in the area of the scaphoid at the base of the thumb then a scaphoid fracture could be suspected. A scaphoid fracture should be treated aggressively and the majority, if they are picked up early enough, can be treated in a plaster cast for between 6 and 8 weeks. In most cases, the fracture will heal. However more problematic and severe fractures will need to be operated on. The blood supply to the scaphoid bone will be so compromised that even with 8 weeks in plaster it is unlikely to heal. A more modern technique called a percutaneous technique means the wrist is operated on without having to open up the wrist surgically but by inserting a screw through the bone to immobilize it via a tiny hole. This is attractive for the self-employed or professional sports people who do not want to have the long recovery time required for a long operation. If a scaphoid fracture is picked up early enough and treated aggressively then it is possible to get reunion of the bone and good results. If the bone does not heal either because of a cyst on the bone or a collapse of the bone then more complicated techniques are required such as a bone graft where a piece of bone from elsewhere in the wrist is transferred. However, if a scaphoid fracture is picked up early and treated with a plaster cast or percutaneous screw then the need to avoid invasive open surgery can be avoided.